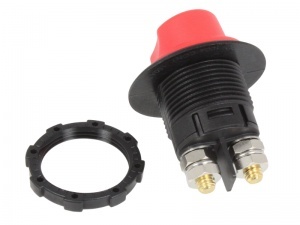 Miniature battery isolation / master switch designed for panel mounting in a standard 29mm dia. accessory hole. 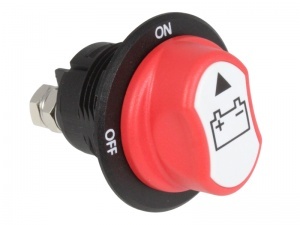 This switch is the perfect solution for isolating domestic circuits from the leisure battery in a campervan, caravan or motorhome where a toggle/rocker switch is not sufficient but a full size isolation switch is too bulky. 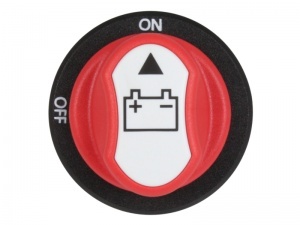 Useful for preventing battery drain if left for long periods or for isolating the power source in an emergency. Voltage rating: 32 VDC max. This one actually works. I use this on my portable power pack. it has replaced several of the cheap removable red key type isolation switches all of which failed within days. Good product!